A note concerning their culture:The full development of the beauty of daylily flowers (size, shape and colour) is essentially influenced by the supply of water during the flowering period. During this period a too dry garden can cause a disappointing flowering behaviour of even top class varieties. Our experience shows that fertilizer seems to be of minor impact on the beauty of the flowers. It is of more importance for the growth of the plants. What we aim for in breeding: Pure and uniform colours or clear colour contrasts, perfect opening behaviour and colour development under the weather conditions of central Europe, excellent branching, vigorous and healthy plants. The GdS quality evaluation of new European daylily varieties is done in a group of three trial gardens in areas with different climatic conditions. A two-step procedure is used which, in the third year after planting, leads to awards for the best varieties. The procedure is not designed in order to find the varieties with the most beautiful single flowers, but it uses a sophisticated point scheme to honour the varieties with the highest total value as a garden plants. Varieties that have got an award under this trial system can be considered as the elite among the garden varieties, even if they cannot produce the most spectacular single flowers. 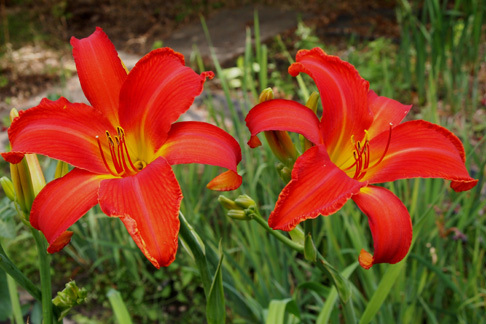 In respect to height this variety cannot compete with our varieties Berlin Tallboy and Red Tallboy, but with stems of 120 cm it is one of the tallest among the dark daylilies. The colour of the flowers is very often darker than shown in the left picture and can be black-purple under favourable weather conditions. The stems are well branched and always stand upright. DARK TALLBOY is very fertile in both directions. This variety was selected as the best when Karl Rupp studied a large collection of pictures of our eyed daylily seedlings. In the years after the plant has confirmed this judgement by being very floriferous and vigorous in our garden and the Rupp garden. The flower spikes are 80 cm tall and well branched. The large flowers open beautifully, develop their colour reliably and are very fertile in both directions. A small flowered tetraploid that thrilled us from its first flower. The yellow colour of the flowers is somewhat darker than shown in the pictures, leading to a strong contrast to the red eye- and edge-pattern. The flower spikes are 65 to 70 cm tall and adequately branched. 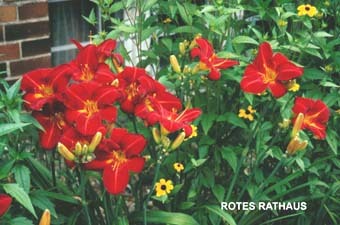 KLEINES ROTAUGE flowers in the middle of the daylily peak bloom period and is fertile in both directions. For the first time we offer with DING DING DONG a variety, that comes from a cross between an eyed variety and the tetraploid form of MiniSpeciesChina. The eye of the mother variety Rock Solid is only slightly visible in this hybrid, but the width of the petals and the opening behaviour are derived from the mother. This variety is small flowered and excels by flower stems of 110 cm height and a multiple branching. Since a clump of this variety has a good garden effect due to its height and the numer of flowers, it can be considered as a landscape variety. Seeing the picture one could assume, that this a small flowered variety. However, it comes from the cross Pat Garrity x Magical Mystery Show and develops it large and wide flowers on well branched stems of, unfortunately, only 65 cm height. 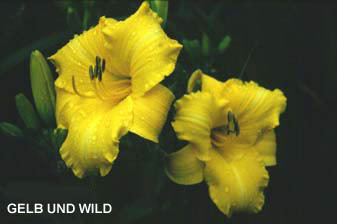 A vigorous daylily for the foreground with relatively wide leaves. 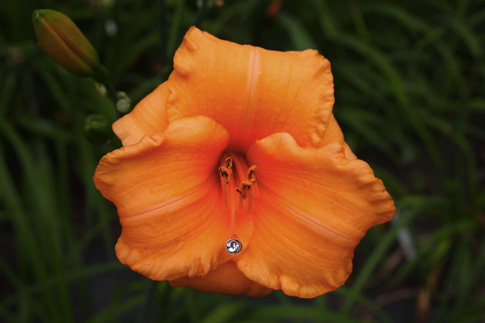 This jewel came from a cross of Knickknack x Hemerocallis vespertina. From Knickknack it got the small, wide and open flowers, from H. vespertina it got flower spikes of 130 cm height and excellent branching. As a result of colchicine treatment this variety has become partially tetraploid and can set sed with diploid and tetraploid pollen. The pollen of BERLIN VESP itself has tetraploid potential, too. Apart from its breeding capabilities BERLIN VESP has the qualities of a landscape variety. With the same parents as our earlier and very popular variety From China with Love this variety proves the value of its mother Knickknack and its father MiniSpeciesChina. GOLD AUS CHINA is an elegant, small flowered variety with grass- like narrow leaves, wiry firm stems and excellent branching. 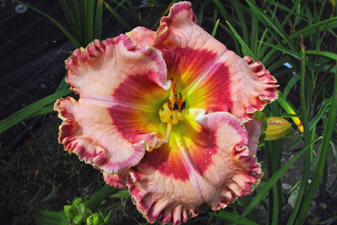 In the European daylily trials 2015 this variety got the award “Excellent Landscape Variety”. The colour combination orange/crimson red could perhaps be considered as not very tasteful by stylists. In the flower of FORBIDDEN CONTRAST it is put into practice in an attractive way. It is interesting that the crimson aspect of the eye becomes visible only from a small distance. From a larger distance the eye seems to be scarlet red. Flower spikes of this variety are about 70 cm tall. 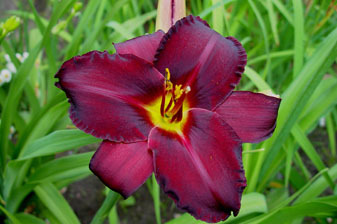 In the European daylily trials 2013 Forbidden Contrast got the award “Recommendable Garden Variety”. On a first look this seems to be a daylily without special merits. However, it flowers already in the second half of June and, considering this early flowering period, it is relatively large flowered.The plant is floriferous and vigorous and comes from the cross Berlin Lemon Crepe x Tetra Stella de Oro. 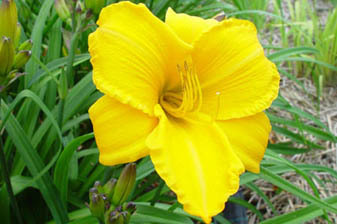 In this case the triangular character of a daylily has become a sign of elegance. 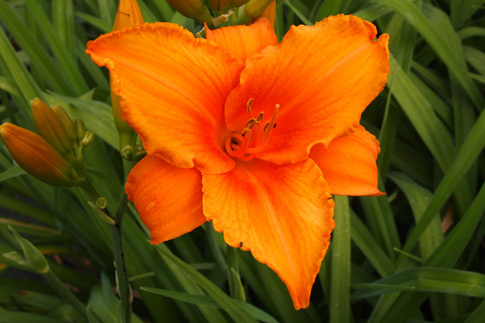 The bright orange colour should not be mistaken for the daylily colour “melon”, which is based on different genetics. The deeper orange colour of the throat area results in a very intense colour effect. The flower spikes of about 80 cm height produce a maximum of only 12 buds, but this is compensated by the number of spikes. Parent plants are Shanty Town and “Berlin Flame”(not registered). In the European daylily trials 2016 this daylily received the award “Valuable Garden Variety”. “Berlin Multi x Gladys” is the cross that produced this diploid daylily with its upright stems of 150 cm height. 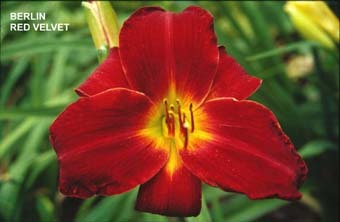 The flowers are of medium size and look sideward, an important aspect with very tall daylilies. Flower spikes are well branched and carry up to 28 buds. STRAHLEMANN flowers during the late main flowering period. Since its first flower this small flowered daylily has been our special darling. It comes from the cross Berlin Wings x Tetra MiniSpeciesChina and is, therefore, our second introduction that is derived from the tetraploid form of this Chinese species (ev. = Hemerocallis plicata). The flowers excel at a perfect opening behaviour and are presented on upright stems of 110 cm height, which are excellently branched and can produce up to 30 buds. The flowers are of a deep melon colour, which, under favourable weather conditions, can reach a nearly glowing intensity. This variety is very fertile in both directions and a powerful hybridizing tool. It flowers during the main flowering period. One of our best introductions. Among the large number of “white” seedlings we have flowered during the last 20 years this one excels at vigour, height (90 cm) and branching. Up to 18 of the large, slightly ruffled flowers can be developed by one flower spike. The yellow throat is small and the yellow hair line around the petals is narrow.WEISSENSEE flowers during the early main flowering period. By crossing our variety AUGUSTFREUDE with the fall flowering species Hemerocallis littorea we got this daylily, which, since its first flowering, was alway still in bloom at the beginning of September. The flower spikes of Septembergruß can grow to 150 cm height and can develop up to 35 buds. The golden yellow flowers are of medium size. For the garden effect of such a tall variety it is important, that the flowers nearly always look sideward. 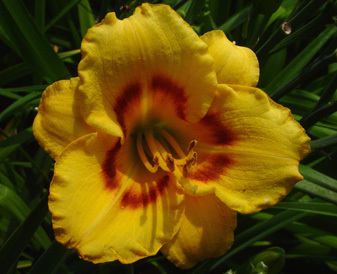 A mighty daylily is our ZIMTSTAUB ENCORE; mighty by the long distance effect of the deep golden colour, mighty also by the structure of the complete plant with its large flowers, strong stems and lush foliage. Depending on the weather situation the value of the golden yellow is enhanced by a sprinkling of cinnamon dust. 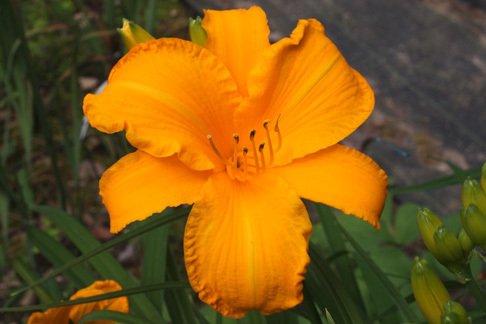 A large flowered and wide petalled daylily of a relatively uniform orange colour. Compared with our earlier introduction in this colour class this one has a wider and more modern flower shape and more ruffling. Stems grow to a height of 85 cm and are well branched. This variety flowers in the second half of the peak bloom periad. The left picture shows a flower after a warm night; the right one shows flowers after a cool night. MARIANNE TAMBERG is named in honour of the breeder's mother. In its first year of bloom this tetraploid daylily was a dream in pink and it is still today.From its seed parent SEMINOLE WIND it has got flower size and width, from its pollen parent DAN MAHONY it has got the depth of colour and the somewhat darker pink ring. After a tropical night, rare in our part of the world, the colour can become rose-red. This variety opens its flowers reliably on stems of about 85 cm height. It flowers during the early part of the main flowering season and is fertile in both directions. Our so far best bright pink daylily comes from a cross between our ROSA PURIST and PINK WAIKIKI, bred in Hawai. The picture on the left side shows a flower during cool and rainy weather and the picture on the right side shows a clump during warm and dry weather.This variety opens its flowers reliably on well branched stems of about 80 cm height. It flowers during the main flowering period, is totally dormant and mainly pollen fertile. We can offer only a few divisions. 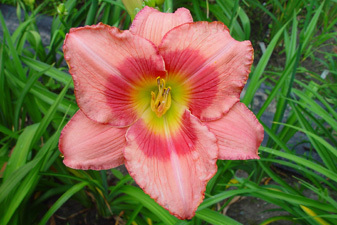 A daylily of “Amerikan design” derived from a cross between the varieties Raspberry Winter and Rock Solid. The very wide flowers with a double edge are of medium size and have a much better opening behaviour than many similar seedlings and varieties. The flower stems are about 65 cm high and can develop up to 15 buds. Two qualities have led to the selection of this variety: the number of flower spikes on a single clump and the stabilty of the colours under strong sunlight. KONTRAPUNKT comes from the cross Fooled Me x Velvet Eyes and develops up to 20 attractive flowers on well branched stems of 90 cm height. From the cross Higher and Fire x Maria Callas we could select this variety of robust growth. The colour of its flowers is exactly between the colours of the parents and is best described as orange-red The width of the petals is near to that of Maria Callas, but the unusual sensitivity to sunlight of the latter has disappeared.The flowers are produced on excellently branched, strong stems of 90 cm height during the main flowering period. 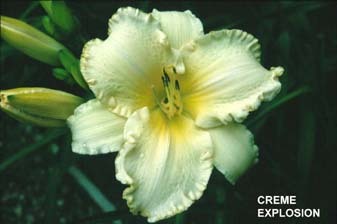 This large flowered daylily comes from a cross between our CREME EXPLOSION and the near white variety CANDOR. The near white flowers of Berliner Schneeball would look even larger, if the the flowers would not roll back so much in the opening process. Stems are well branched an grow up to 100 cm. In the European Daylily Trials 2012 this variety got the award "Recommendable Garden Variety"
On stems growing up to 160 cm this variety produces small, light yellow flowers which nearly always look sideward. The flower spike show a wide branching and can develop up to 35 buds. The charme of Berliner Luft results from the large number of small flowers flying like a cloud of yellow butterflies high above the leaves. 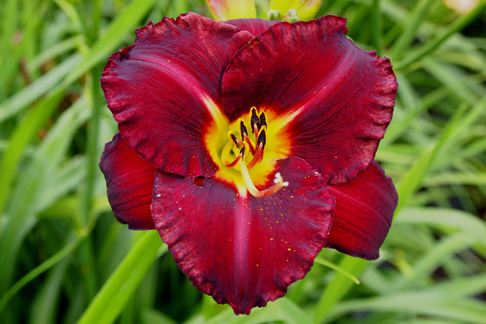 A vigorous and large flowered daylily of medium purple colour, of which we have grown quite a large stock since its selection. Special qualities of this variety are a reliable opening behavior and a high bud count. 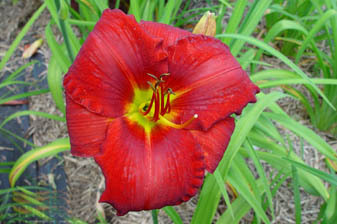 In the European Daylily Trials 2007 this variety got the award "Recommendable Garden Variety". 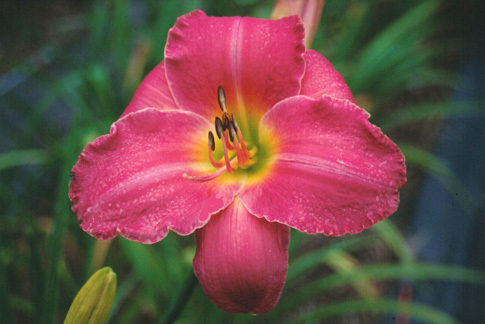 Bright and pure shades of pink are combined in this large flowered daylily. Its flowers spike are well branched and grow to a height of 90 cm. Colour development and opening behavior are highly reliable. In the European Daylily Trials 2011 this variety got the rare award "Excellent Garden Variety"
A cross of our variety KÜSSCHEN KÜSSCHEN with the the US-variety DAN MAHONY produced this charming daylily with flowers of medium size. From its mother this variety got the always perfect opening behavior. The father contributed the crimson coloured ring, which is a bit stronger in nature than shown in the picture. The flower spikes are well branched and grow to about 90 cm. In the European Daylily Trials 2013 KARMINKÜSSCHEN got the award "Valuable Garden Variety"
From the cross Hemerocallis altissima x MiniSpeciesChina comes our second diploid hybrid with the graceful species brought back by Willumeit from China. The small deep yellow flowers have an unusual shape (UFO), that falls under the international definition of "Spathulate". The flowers open on stems with thin , wiry branching and a hight of up to 150 cm. KEULENFALTER flowers during the main daylily flowering period and is moderately fertile. Only a few divisions are available. This cream-white tetraploid is a child of our CANARY CHAOS and it deserves a lot of attention by its delicate wine red eye and an edge of the same colour. The well branched stems are about 75 cm high. It flowers in the later part of the main flowering period.In the European daylily trials 2010 it received the award "Recommendable Garden Variety". A large flowered tetraploid with star-shaped, wide petalled flowers of intense light yellow colour. Under very warm weather conditions the flowers will roll back to some extent. This is a daylily with a good long-distance effect in the garden.In the European daylily trials 2007 it received the award "Recommendable Garden Variety".The flowering spikes are about 85 cm high. The flower face of this small flowered daylily (diameter 6-7 cm) is pleasant, but not sensational. It comes from the cross SUNNY BIT x BABY MOON CAFE, two especially well branched and floriferous parents. Both parents are excelled by PLURALIST. In case you look for a daylily that produces a myriad of flowers for a long time on strong clumps, PLURALIST is the right one. Hight about 80 cm, flowering during the first half of the main flowering period.In the European daylily trials 2013 it received the Award "Excellent Garden Variety" and also became "European Daylily of the Year 2013"
Our seedling with the working name "Berlin Orange" crossed with SHANTY TOWN gave us the variety ORANGEFACKEL, the vibrant orange of which is shown on a photo only with difficulties.Every year our stock planting of this variety is covered with a nearly coherent layer of flowers.The flower spikes are well branched and have a height of about 75 cm.Due to the vigorous growth of this variety we can introduce it at a rather low price. Because of the silky smooth surface structur of the flowers this variety is especially rain-fast. Under favourable conditions the flowers can be even darker than shown in the picture, but can still have a colourful aura. The flower spikes are about 70 cm tall and well branched.This is one of our special favourites. It is completely dormant and fertile in both directions. 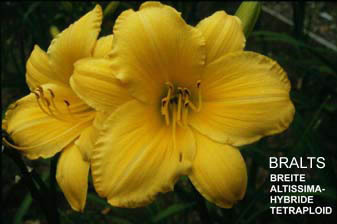 During the European daylily trials in 2010 it got the award "Recommendable Garden Variety". The seedlings from the cross BILL NORRISs x GOLDELSE were all strongly ruffled, but only GOLDFILIGRAN showed a perfect opening behaviour combined with a uniform, deep golden yellow and sunfast colour. The flowers are of medium size and show a pronounced "sculpturing". Flower spikes are 65 cm tall. Fertile in both directions. - For us, the production of this variety is the fulfillment of a dream in golden yellow. 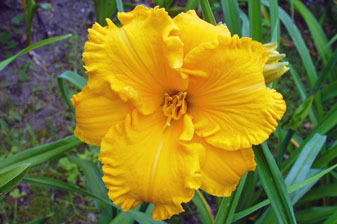 As a result of the European daylily trials in 2010 it got the award "Valuable Garden Variety". 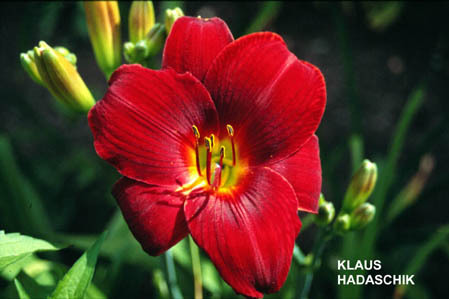 The same year it won the title "European Daylily of the Year 2010". 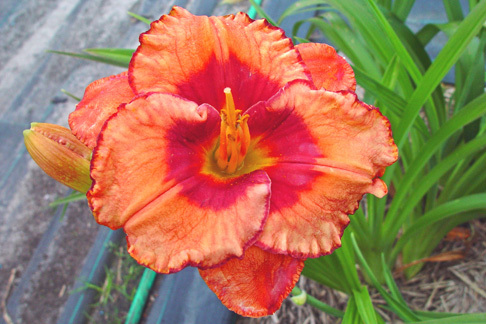 The medium sized flowers of this tetraploid daylily often show a stronger contrast between wine red and orange than shown in the picture. The flowers are round, wide open and are produced on stems of about 75 cm height. 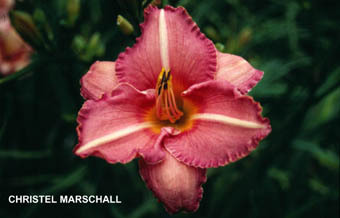 This variety is fertile and flowers during the second half of the daylily main season. An interesting result of crossing our very large flowered, brown seedling SHTT9701 and the small flowered yellow and black variety WITCH'S WINK. 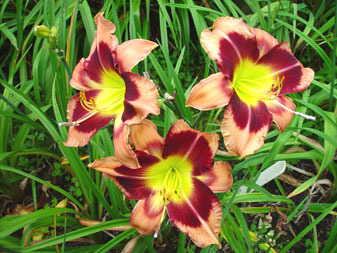 During the European daylily trials in 2009 it got the award "Recommendable Garden Variety". From the cross ARCTIC SNOW(near white) x SUDDEN FIRE (rose-red) we got quite a number of attractive near white seedlings. Crème de Berlin is the best one of them. The flowers are somewhat similar to those of Berlin Creme Ball, but they are brighter, larger and of better shape. 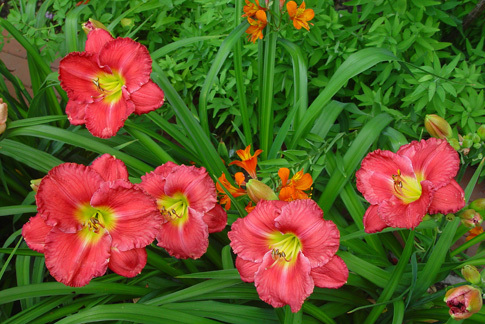 The plant flowers on stems of 80 cm hight during the daylily main flowering period. In the trials of new European daylily varieties Crème de Berlin got the award "Recommendable Garden Variety". The large flowers of this vividly coloured variety can be traced back to our large flowered seedling SHTT9701 crossed with our eyed and edged variety CANARY CHAOS. - Among the many beautiful eyed daylilies we have produced there are, unfortunately, only very few that show satisfying vigour. HINGUCKER is one of the best among these few. Furthermore, this variety is extremely floriferous and produces excellently branched flower stems of about 80 cm height. 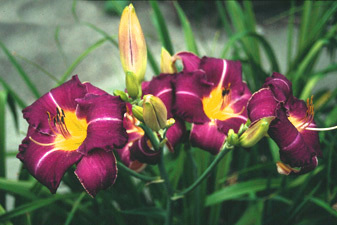 The father of this variety is a very dark spidery daylily with strongly rolled back flowers. We got it as a gift from Klaus Kwasnitza and crossed it with our own variety DUNKLE PRINZESSIN as the mother plant. The floral parts are not as narrow as requested for a true spider, but the throat colour area is small and the plant is very fertile in both directions. 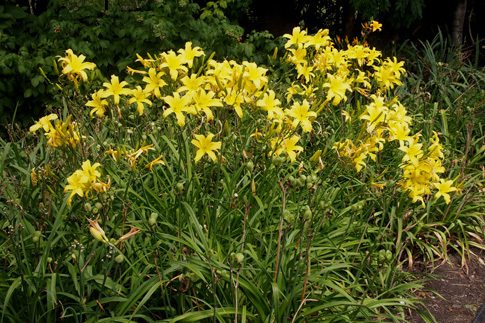 It flowers on stems of about 75 cm height during the daylily main flowering period. This is the first time that we offer a variety from the field of unusual form varieties. Unfortunately we cannot yet show a picture that demonstrates how vigorous and floriferous this landscape variety can be. On demand by garden designers a special category for landscape varieties was added to the rules of the GdS daylily trials. Such daylilies excel more in respect to clump effect, weather resistance and visibility from the distance than by size and beauty of single flowers. When we sent TROMPETENKONZERT as a first contribution to this type of trial, it received the rare award "Exceptional Landscape Variety". Clumps of this variety produce a forest of well branched stems and open small, light yellow flowers over a long bloom period. With BIG BLUE as father this tetraploid daylily is large flowered as we expected. On strong stems with wide branching it produces strongly ruffled flowers with heavy substance. 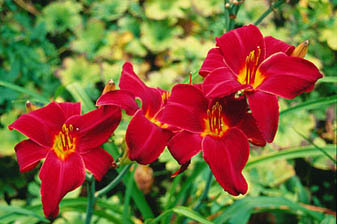 As a result of the European daylily trials in 2006 it got the award "Valuable Garden Variety". The same year it got the newly invented title "European Daylily of the Year" from Hemerocallis Europa. Under warm weather conditions the colour of the flowers is normally whiter than shown in the picture. Named in honour of "Weisse Rose", the German resistance group against the nazi regime. 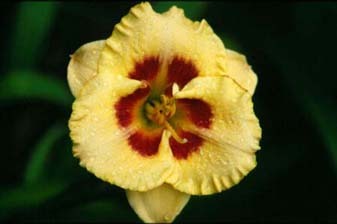 Numerous small and round flowers are produced by this tetraploid daylily. In contrast to its mother variety WITCH'S WINK it is completely hardy. It flowers on well branched stems of about 70 cm hight. Bud open always completely, but the colour can vary to some extent according to temperature. A variety with excellent clump effect in the garden. This daylily radiates beauty by simplicity: the flowers are of a very pure and intense yellow with no hint of orange-yellow or lemon-yellow. Flowers are large, have only a small green throat and develop on stems of about 70 cm hight. In our garden this variety has formed dense and floriferous clumps. A flower that may induce to meditation. Another large flowered tetraploid in a pure orange. The colour is slightly deeper than that of ORANGE VON FALKENREHDE. The plant stands out by its excellent branching and flower spikes of up to 110 cm hight. In the European daylily trials 2004 this variety got the highest number of points and the award "Valuable Garden Variety". It was planted in Missouri/USA and received positive comments. Fertile in both directions. This is our first named variety derived from a species, that was collected in the wild by Willumeit in China. Because of its lacking botanical identification we call it "MiniSpChina". From a cross of this species with the miniature flowered variety KNICKKNACK we obtained a group of seedlings with wiry, upright stems with wide and multiple branching.FROM CHINA WITH LOVE is the best of them. Its small flowers open much better than those of KNICKKNACK and are produced on numerous stems up to 100 cm tall high above the narrow leaves. The garden efffect of an established clump is exuberant as well as graceful; diploid; fertile in both directions. A large flowered tetraploid from LOOK x ULLA WILSCH, characterized by flat/round flowers and an intensive orange-yellow colour. It flowers during the second half of the main flowering period and it is, therefore, a useful representative of the golden colour towards the end of the bloom season. Height of flower spikes: ca. 75 cm. Among many red seedlings from the same cross SCHLOSS BELLEVUE stood out by its uniform dark red colour with only a small throat and by the height of its stems. They can be up to 100 cm tall and they show the large flowers high above the leaves. 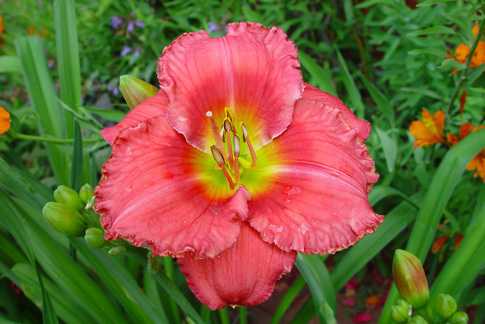 Bellevue is not fully resistant against the lighter spots that occur so often on red daylilies, but its beauty is affected to only a very small extent. SCHLOSS BELLEVUE flowers during the daylily midseason period. From the cross ARCTIC SNOW(near white) x SUDDEN FIRE (rose-red) we got quite a number of attractive near white seedlings. Crème de Berlin is the best one of them. The flowers are somewhat similar to those of Berlin Creme Ball, but they are brighter, larger and of better shape. 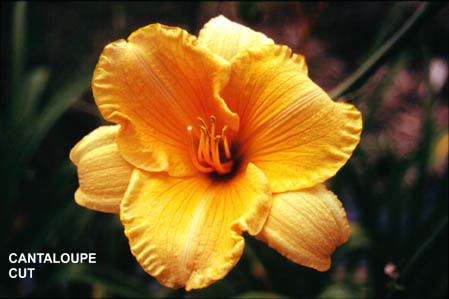 The plant flowers on stems of 80 cm hight during the daylily main flowering period. 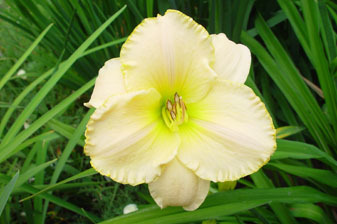 In the GdS-trials of new European daylily varieties Crème de Berlin got the award "Recommendable Garden Variety". 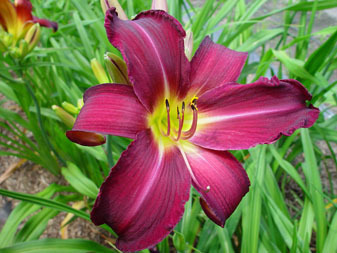 The crimson-red colour range is not very often found among daylilies. From a cross of two crimson-red parent varieties (CHARLES JOHNSTON x WATERMELON CANDY) we got our BERLINER RUBIN. Inherited from its mother it has flower spikes of only 60 cm height; however, the flowers are clearly held above the leaves. The variety is floriferous and fertile. Planted in the foreground its special colour always calls for attention during the midseason period. 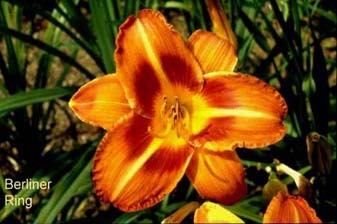 In the Europea daylily trials it received the award "Recommendable Garden Variety". This is a spectacular daylily. It comes from the cross REGAL BRAID x EL DESPERADO and shows a blackish wine red eye and an edge of the same colour on a bright canary yellow background. CANARY CHAOS is floriferous and fertile. The branching is of medium quality, but we have counted up to 15 buds per stem. In the beginning we have used the plant so intensively for breeding purposes, that its propagation was a bit neglected. A large flowered light red tetraploid from the cross ROTES RATHAUS x SEASONS GREETINGS, which always impresses us by the garden effect of its colour from the distance. The fiery red, wide open flowers are produced on excellently branched stems of about 75 cm height. FIESTA CUBANA is floriferous and very fertile in both directions. 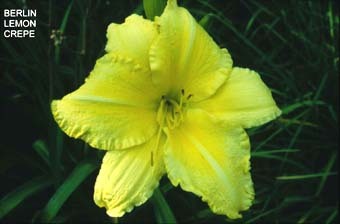 During the GdS daylily trials in 2004 it received the rating "Valuable Garden Variety". 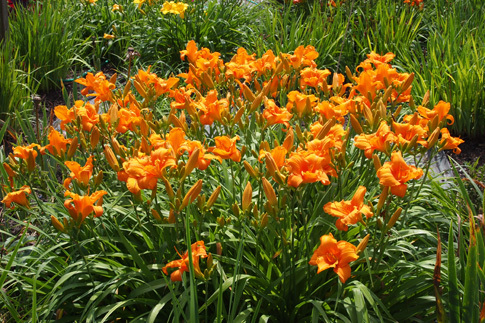 It flowers mainly in the first half of the daylily flowering period. Our first introduction of a small flowered daylily is derived from the tetraploid RASPBERRY CANDY, however, concerning its flower shape it is much more perfect than this parent variety. 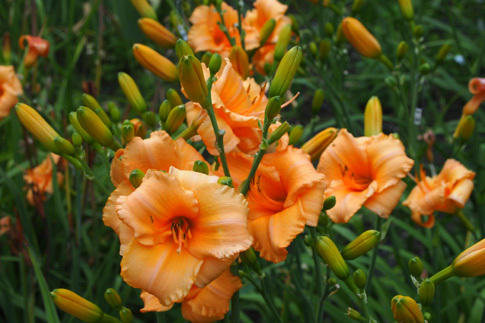 Only very few daylily varieties are able to produce perfectly opened and in respect to colour and shape completely developed flowers during the full flowering period. KÜSSCHEN KÜSSCHEN is one of these varieties. On excellently branched stems of 70 cm height it develops up to 25 flowers of about 8 cm diameter. 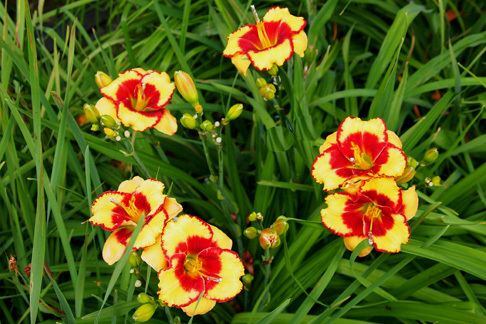 It flowers during the second half of the daylily flowering period and is fertile. 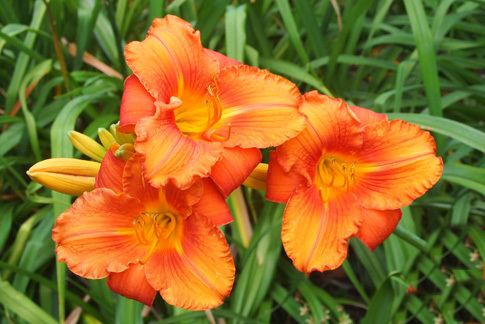 Orange in daylilies is a difficult and rare colour. We have grown several generations of seedlings, from which finally a plant with the qualities of ORANGE VON FALKENREHDE appeared. The colour is a pure orange and not, as in many other so-called orange coloured varieties, a red applied by the plant as an extremely thin layer and, therefore, being very sensitive. The well branched flower stems are about 80 cm tall and can produce up to 18 of the wide open flowers during the main flowering season.A clump can have a tremendous garden effect from the distance. 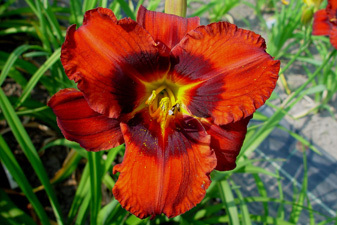 Finally we are able to offer this very special red tetraploid which is named after a sports friend, who died too early. The variety stands out by a brilliant medium red combined with a network of darker red veining. The relatively large flowers have a small throat and are held on upright, well branched stems of about 80 cm height. Flowering period: medium to late main season; excellent breeding plant for pure red shades. This tetraploid is noted for the intensity of the deep blood-red colour of the flowers and the extremly rich branching of the stems of up to 100 cm height (up to 40 buds have been counted). The flowers have only a small yellow throat and open slowly but reliably. Flowering period: late main season; because of the dark colour this variety should best be admired from a short distance, and it should be planted in a sunny spot. 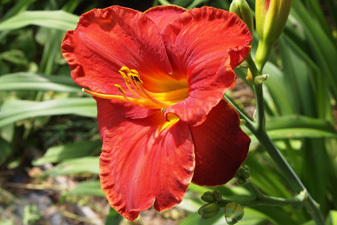 In the European daylily trials it received the award "Recommendable Garden Variety". An elegant tetraploid novelty in the "near white" colour class, selected from seedlings of the parentage HELLE BERLINERIN x ARCTIC SNOW. Its large flowers show a strong ruffling and open to a moving shape; strong stems of about 80 cm height are extremely well branched and can produce up to 30 flowers; flowering period: early to medium main season; fertile in both directions; valuable breeding plant. Named in honour of a famous ballroom dancing trainer in Berlin, this tetraploid variety is our fourth pink daylily introduction; producing large flowers on well branched stems, its deep pink colour, enhanced by lighter midribs, is of special beauty in the light of the early evening; it is vigorous, healthy and fertile; flowering period: medium to late main season. The yellowish orange with some pink components that becomes visible when a Cantaloupe Melon is cut, is approched in this tetraploid new introduction; on relatively tall stems with excellent branching this variety produces wide and slightly ruffled flowers with good opening behaviour; an attractive, vigorous and fertile cultivar; flowering period: medium main season; in the Eorpean daylily trials in 2002 this variety got the rare award "Excellent Garden Variety". 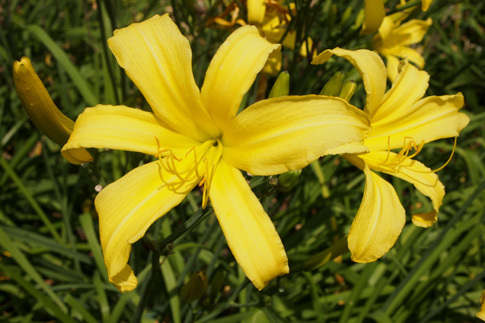 The tallest large flowered tetraploid daylily we know of with stems up to 180 cm height; yellow with a hue of cinnamon, tetraploid, fertile; flowering period: medium to late main season; needs an open, sunny position in order to develop strong upright stems. Very few plants available. 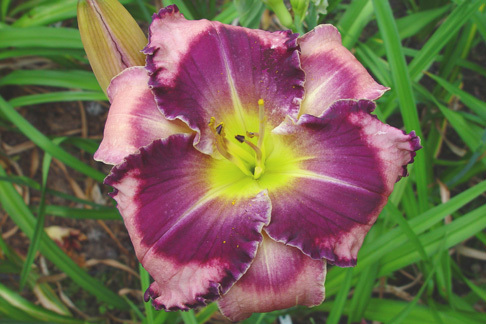 We registered this beautiful, tetraploid daylily after having seen the first flower. We should better have waited until we were able to introduce it. Now, quite a lot of stock has developed and this allows the introduction of this highly garden-effective cultivar at a reasonable price. The pure yellow flowers open easily and show a wide and regular star shape with some pronounced ruffling. This large flowered tetraploid is so far one of the best of our introduced golden yellow cultivars. The wide petalled, rather round flowers of up to 16 cm diameter show a uniform and very deep golden yellow and they are presented on well branched stems. The colour does not fade under even intense sunlight. Due to the somewhat short stems the variety is especially useful for foreground planting. It flowers during the second half of the main flowering period. Die folgenden zwei gelben Einführung aus dem Jahre 2001 sind wertvolle Gartenpflanzen, die jedoch weniger wegen ihrer spektakulären Einzelblüten als wegen ihrer züchterischen Bedeutung eingeführt wurden. Sie erlauben die Benutzung neuen genetischen Potentials bei der Züchtung von Tetraploiden. Breeding H. altissima hybrids the breeder has the severe problem of overcoming the narrow trumpet shape of the wild species. The Altissima hybrid BRALTS for the first time shows wide flowers which open flat. They are produced on stems of 100 cm height and they always look into a horizontal direction. This is important for the garden value of a taller variety. BRALTS is tetraploid, narrow leaved, vigorous and fertile. The colour tends towards maize-yellow and produces a quiet garden effect. 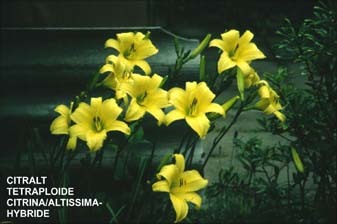 A tetraploid hybrid that contains genetic material of the species H. altissima and H. citrina. The plants is vigorous and very floriferous. The light yellow flowers are of a moderate trumpet shape. and are extremely seed fertile. A large flowered tetraploid that attracted our interest by its always changing, but pleasant shape of the flowers. It forms big plants presenting the brilliant yellow flowers on stems of 80 - 90 cm height. Our first introduction in the dark purple colour class. The flowers of this special beauty open quite well, and after really warm nights the colour may become even darker than shown in the picture. The strong stems of up to 85 cm height show a multiple branching and can develop up to 30 buds. The flowers are highly resistant against rain and they are less endangered by strong sunlight than many other dark varieties; tetraploid, fertile and vigorous. After being withdrawn for propagation this near white tetraploid is again offered. On stout and extremely well branched stems of up to 100 cm hight it produces many of its large and wide open flowers, of which often several ones are open at the same time; vigorous and fertile. 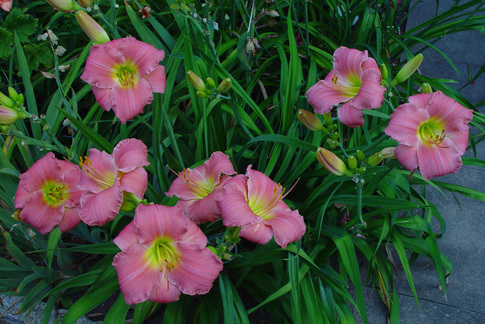 This tetraploid variety colour-wise comes very near to our ideal of a pink daylily. The colour is nearly free of salmon- pink components. The nearly green colour of the throat enhances the purity of the pink. The flowers of this variety are of medium size, and they are produced in large numbers on strong stems of unbelievable branching and a height of about 70 cm. This large flowered tetraploid produces starshaped, red flowers on well branched stems of up to 150 cm hight. After being withdrawn for propagation it is now again offered. 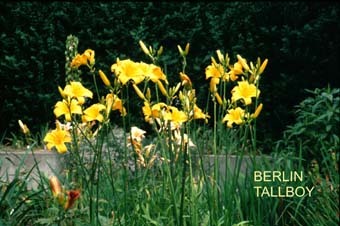 It is not related to BERLIN TALLBOY, but it is derived from H. altissima. Vigorous and fertile; however, it should be noted, that the very tall varieties need some time to regain their maximum hight after being replanted. A large flowered, lemon-yellow tetraploid derived from ERIN PRAIRIE x FABULOUS PRIZE; flowers are ruffled, have a green throat and a creped structure; they are alway held in an attractive position; fertile; an adequate child of its super parents; it found much attention even in 2011 surrounded by many new varieties and seedlings. The flowers of this large flowered variety start to open the previous day; it shows very well the velvety surface structure of the deep red and wide petals, good branching , small greenish throat, fertile, Award of Garden Merit, Wisley 1993. Being a big tetraploid in all parts, this one has an early flowering period and shows an orange-yellow base colour with a contrasting red-brown ring; very visible in the garden; needs carefully selected partner plants; goes back to ESPERANZA as one of the parents; height about 100 cm; fertile. One of the varieties we like most because of its garden effect, but also for its value as a breeder's plant. This child of RUNDBLICK can develop up to 92 buds per stem on stems of about 135 cm hight; the variety is vigorous, floriferous and highly fertile; diploid; its flowering period is near to the end of the main flowering period; an important breeding plant for tall, multi-budded cultivars with late flowering period. Of our varieties BERLIN LEMON (lemon-yellow), BERLIN RED (red, best branching, FCC Wisley), EARLY GLOW (orange-yellow, very early), BERLINER PREMIERE (orange-yellow, very early), GANZ ROT (uniform light red), we offer divisions at € 5,-- each. We offer divisions of the species H. citrina (collected in the wild in China), H. altissima and H. fulva v. sempervirens (possibly H. fulva v. littorea, according to Jürg Plodeck, but reliably flowering each fall) at each € 6,--. This variety can be considered as the Siberian iris with the most beautiful single flower in deep blue with a pronounced white signal area. Still one of the most ruffled Siberians available. The flowers of a light wine red colour produce nearly horizontally held falls. Dave Niswonger, the famous iris- and daylily breeder from Missouri, has named this delicate beauty and has sent us a division of it. This cultivar grows up to 60 cm in hight, producing medium sized pink flowers with a deeper pink throat ring on well branched stems. A diploid variety with small flowers of intense dark crimson red colour and a very small throat. A large flowered spidery diploid producing lavender coloured flowers. Gesellschaft der Staudenfreunde (Fachgruppen Iris undHemerocallis) Klick here to study the relevant homepages ! Many of our Iris cultivars were tested for garden value by the BIS/RHS . In 1999 our BERLIN RUFFLES got the British "Dykes Medal". Other varieties got awards like "Award of Garden Merit" and "First Class Certificate". In case of the Hemerocallis the "Gesellschaft der Staudenfreunde" runs a trials procedure over two years. During the last 25 years some of our daylily cultivars were among the winners and received the "Karl-Foerster-Medaille". In 2003 our varieties CANTALOUPE CUT and BERLIN CREME BALL were the winners of this trial and were rated as "Outstanding garden variety" and "Valuable Garden Variety". In 2006 and 2010 our varieties WHITE ROSE MEMORIAL and GOLDFILIGRAN became "European Daylily of the Year".